To Hermion on the "Ships starting with H" page. Source: Iris Aamot - whose husband was cook on board during the war. Manager: Bruusgaard, Kiøsterud & Co., Drammen. Built in Vegesack in 1937. From Sept.-1937 to Sept.-1939 on charter to Kawasaki Kisen KK, Kobe, Japan. From June-1941 to April-1946 under control of Australian government and managed by Orient Steam Navigation Co. Ltd., London. Guestbook message from Cook Hans Hansen Aamot's wife in Australia. He served on Hermion after having taken part in M/S Lidvard's incredible escape. She's interested in getting in touch with someone who knew him, either on Lidvard or on Hermion. Another Guestbook message from the son of Olav Rye Winger (who served as 2nd mate and radio operator on Hermion from Sept.-1938 till Sept.-1942, then joined Agnes). A few days later he posted this message. Guestbook message - From the daughter of the above Olav Rye Winger who settled in Adelaide, Australia after the war. She says that Hans Knapstad and Sverre Anderson, who were also part of the crew, also settled in Adelaide. Guestbook message from a Norwegian relative of the above. Yet another message - From the nephew of Rolland Ritter, who is said to have died of smallpox on board Hermion. Guestbook message from a relative of Assistant Steward Ian Walter Munchenberg, who served on Hermion but died of smallpox - ref. narrative below. March 9 Adelaide Sydney, N.S.W. March 16* Independent *Page 4 gives arrival March 14. Oct. 19 Caloundra* Townsville Oct. 22 QL 22 *Brisbane. Nov. 14 Caloundra* Newcastle, N.S.W. Nov. 16 PG 82 *Brisbane. Apr. 10 Alexandria Bone Apr. 17 MKS 46 Alexandria to Bone. July 30 Melbourne Fremantle  Independent Page 5 gives arrival Aug. 6. (on to Port said Oct. 31). As will be seen when going to Page 1 of the archive documents, Hermion was on her way from Corner Brook to Kingston, Jamaica when war broke out in Norway on Apr. 9-1940. She appears to have spent quite a long time at Suez the following year, having arrived there from Aden on March 30-1941. Departure is given as May 19 - see Page 2. Hermion was one of the Norwegian ships involved in the search for survivors from the Australian cruiser HMAS Sydney in Nov.-1941, but none were found. Herstein and Pan Europe were also involved, and according to this posting on my Ship Forum, Nordnes and Ohio also took part. Sydney had sunk, and had been sunk herself with the loss of all her men by the German auxiliary cruiser Kormoran on Nov. 19 - the external websites that I've linked to at the end of this page have more information (survivors from the German cruiser had been rescued from rafts and lifeboats southwest of Carnarvon, West Australia by allied ships on Nov. 24). Going back to Page 2 above, we learn that Hermion had departed Melbourne on Nov. 16 and arrived Colombo Dec. 5. Hermion was later part of Convoy JS 1, which was organized to move the Australian division in Palestine to Singapore early in the year of 1942 (see background history under Pan Europe above). The ships arrived Colombo at the end of January and continued east on Febr. 3, but en route it became clear that Singapore would fall to the Japanese forces, thereby also posing a threat to Sumatra, so it was decided to move reinforcements there instead. Hermion and 4 of the convoy's ships were rerouted to Oosthaven at the southern point of Sumatra (again, see Page 2), escorted by cruisers, while the Norwegian Prominent and the rest of Convoy JS 1 were sent to Batavia, arriving Febr. 14. A. Hague has also included Hai Lee in this convoy (also went to Oosthaven) - ref. link provided in the table above. (Hindanger was on her way from Suez to Rangoon with 250 British troops and equipment when Rangoon fell [March 8] and was rerouted to Bombay). Her 1943 voyages start on Page 3 and continue on Page 4, which also shows some of her early 1944 voyages. Convoy information for some of them can be found in the Voyage Record. "Have just been reading about the Hermion and very interested about the two boys who died and were buried in Egypt. I am wondering if they were the same boys that my husband Hans Aamot told me about many times. There were two boys from South Australia, I think they were galley boys when Hans was cook. When they were in the Persian Gulf the boys got smallpox. Everyone was frightened to look after them so Hans was the only one that helped them. He looked after them and was so sorry for them, but unfortunately they both died. Sounds very much like the same boys. Hans had been innoculated for smallpox back in Norway when he was young and always said that that saved him catching the smallpox from the boys. He didn't know who their family were and would have liked to have contacted them when he came back to Australia. He often spoke of them". Iris has told me that her husband Hans may have been Hermion's steward at that time, in other words, I. W. Munchenberg may have been his own assistant. Note also that in this message in my Guestbook, there's mention of a Rolland Ritter, who is also said to have died of smallpox. According to the Australian War Memorial, he had served as mess boy on Hermion, and died in Alexandria on Apr. 21-1944 (again, ref. external link below). The archive document shows that Hermion was on her way from Bone to Port Said and Australia on that date. Page 5 also lists Hermion's 1945 voyages, while Page 6 shows some early 1946 voyages. During 1947-48 she was on charter to Wilh Wilhelmsen for Australian service. Sold in 1957 to Karl Gross, Brake, Germany, and renamed Adele Ohlrogge. Sold to Spanish breakers and arrived Puerto de Santa Maria on Dec. 17-1966 to be broken up. History of MAS Sydney and several others. HMAS Sydney Honour Roll - Names of her casualties. Commemorative Roll Database - (Australian War Memorial). By entering the names of Hermion's 3 crew members who died, with "Second World War, 1939-1945" in the other search field, more details will appear. Harry F. Willis is said to have died at 1st General Hospital, Middle East on May 4-1944. As already mentioned, cemetery is given as Moascar War Cemetery, Egypt. Assistant Steward Ian Walter Munchenberg is said to have died at Port Said on Apr. 18-1944 of smallpox, buried at Bone War Cemetery, Annaba, Algeria. Messboy Ronald Trevor Ritter is said to have died at Alexandria on Apr. 21-1944 (also of smallpox). Back to Hermion on the "Ships starting with H" page. 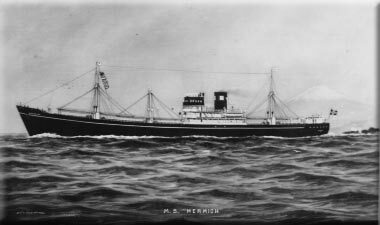 Other ships by this name: Norway had another ship named Hermion later on. Delivered as Høyanger to Westfal-Larsen & Co., Bergen in March-1959, built in Amsterdam, 9477 gt. Sold to Arne Teigens Rederi/Bruusgaard Kiøsteruds Rederi, Drammen in Apr.-1974, renamed Hermion. Taken over by p/r Hermion (Thoresen International), Drammen in 1977, then by Bruusgaard Kiøsteruds Skibs-A/S, Panama in 1981. In 1984 a Hermion was delivered to K/S A/S Hermion (Helge R. Myhre A/S), Oslo, built in Moss, 15 399 gt. Had various Norwegian managers until 2004 when she was sold to India and renamed Maharshi Shivatreya. The text on this page was compiled with the help of: Misc. sources, incl. "Nortraships flåte", J. R. Hegland and various E-mails from visitors to my website.